Symantec steals a march on Intel as IBM makes ground. 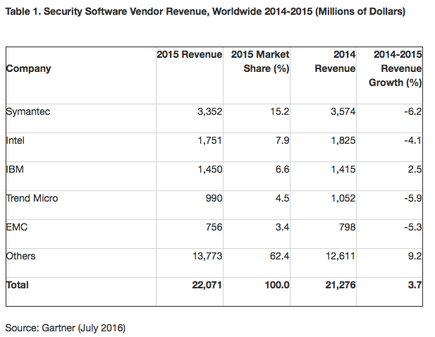 Worldwide security software revenue totalled $US22.1 billion in 2015, a 3.7 percent increase in from 2014. According to Gartner, Symantec maintained the No. 1 position despite the company suffering its third consecutive year of revenue decline and its highest decline in revenue over a three-year period. Research findings show that security information and event management (SIEM) remained the fastest-growing segment in 2015, with 15.8 percent growth, while consumer security software showed the sharpest decline at 5.9 percent year on year. In 2015, the top five vendors together accounted for 37.6 percent of the security software revenue market share, down 3.1 percentage points from 2014. Also, these vendors also displayed a collective decline of 4.2 percent in 2015, while the rest of the market (Others) grew strongly at 9.2 percent year on year. “The below-market growth seen by these large vendors with complex product portfolios is in contrast to the market growth and disruption being introduced by smaller, more specialised security software vendors,” Gartner Principal Research Analyst, Sid Deshpande, added. Specific to vendors, Symantec’s security software revenue declined 6.2 percent to $US3.4 billion. 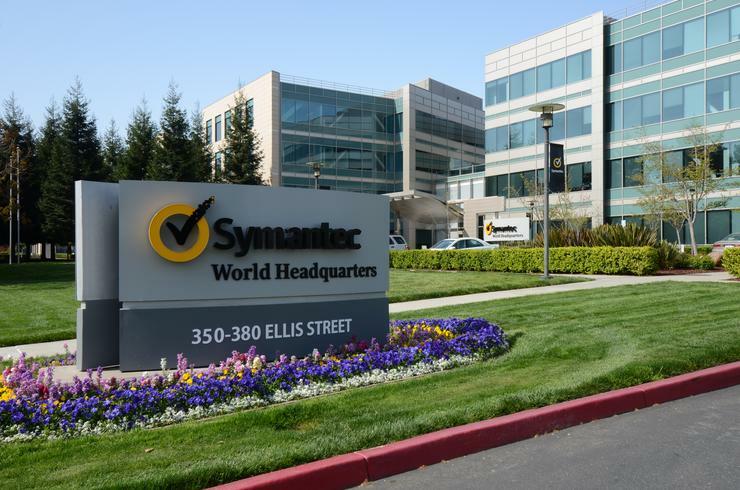 In 2015, 74 percent of Symantec's revenue came from the consumer and endpoint protection platform (EPP) categories, which collectively declined seven percent year on year and were a major contributor to Symantec's revenue decline. Meanwhile, Intel’s security software revenue also declined in 2015, with revenue falling 4.1 percent to $US1.75 billion. Once again, the decline in the consumer and EPP markets, which accounted for 75 percent of Intel's revenue in 2015, contributed in large part to Intel's revenue decline. Gartner said that IBM was the only one of the top five vendors to show growth, with its security software revenue growing 2.5 percent to total $US1.45 billion in 2015. “IBM's growth was driven by its positive performance in the SIEM segment and its significant services business, which generates revenue for its product business,” Deshpande added.